It can be difficult at times for performers like Nigel, as really there is not a large enough audience of sophisticated listeners and promoters anymore to give good songs the chance they deserve, as was the case from the 40's to the 70's when the recording industry was administered by entrepreneurs who really loved music as much as making money out of it. I can only applaud Nigel for realising his vision and sticking to it through the years. This could possibly be Nigel's journey too. The album touches on many folk traditions, at times Celtic melodies, country, blues, haunting road songs, lyrical ballads, and yet always reminds us of our homeland, Australia. The next ingredients are a good studio and good production. Nigel made the right decision here by recording at Windwood Studios in Lawson with Terry Cox, a fine engineer and studio. Andrew Knight's production is honest and warm. It is nice for the producer to be part of the performance team. Obviously, Andrew shares Nigel's passion for songs and the special touches they require. In addition, Don Bartley is really the guru of mastering in Sydney, and as usual his ear for quality is assured. I did however feel that occasionally the violin was buried slightly in the mix. The final ingredients are good performers and the 'right' performance. On this record there are some beautiful moments, including John Stuart's sweet and subtle slide guitars (especially track 4 & 11), Andrew Knight's smooth guitars, Pete Drummond's sensitive percussion and a fantastic guitar performance by Al Ward on ‘Sleeping Like An Angel’. Dawn Egan's and Lisa Williams' harmonies are a lovely addition to the rich tone of Nigel's voice, and the fiddle playing of Simon Watts also gives one the feeling that they just got the 'right take'. My only thought was that on a couple of tracks, (particularly 1-4 and 10), it would have been nice to hear more of Nigel's guitar and voice solo in early verses then bring the ensemble in as additional colour. Also, I felt that these particular songs suited acoustic bass rather than electric bass, but hey, I'm being really picky here. This is an excellent album. Nigel's voice is very true. At times he possesses this deep, haunting resonance and yet his high register is very sweet and clear. He has a lovely understated diction and skilled attention to phrasing which communicates his message well. His songs are good, all of them are good. You don't have to pick out the odd few. Nigel knows his art, and he has successfully recorded a document which has the stories and tells them well. “In the style of Iron and Wine and the great Americana folk artists, Katoomba's own Nigel Foote is carving a spot for his own name in the wordsmith world that is the folk scene. Home By Dark, is a collection of tales of lovers lost, secret rivers and gypsy laughter. Gently infused with stirring fiddle, slide guitar and low-breath harmonies, Home By Dark quietly matures to surprise you in it’s depth and intricacy. 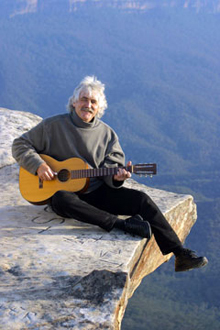 Recorded at Windwood Studios with producer Andrew Knight, and featuring Blue Mountains musicians such as Pete Drummond, Al Ward, Simon Watts and John Stuart, to name a few, the album is Foote's second release. This is what good songwriting is all about. Beautifully crafted songs... wonderful musicianship... worth the wait! I first met Nigel Foote in early 1985 when I was conducting songwriting workshops in the Blue Mountains – not that he had much to learn! I was struck then as I am now whenever I listen to him, at both his easy mastery of melody and his keen perception of the details of human relationships. When you listen to Nigel, you not only learn about him and about the people portrayed in his songs, you learn more about yourself as you catch yourself unawares with a tear in your eye or a smile upon your lips. These are songs of peace, of joy, of tradgedy and of hope – songs about us and our time. Enjoy! As the water smoothes the stones, time has honed Nigel Foote's songwriting skills. His latest offering, Home By Dark is a beguiling album ... evocative ... highly recommended!